Most people hear quinoa (pronounced keen-wa) and are terrified. I once was too, so no fear! Quinoa is a seed, not to be considered a whole grain, even though it is usually prepared as a whole grain. Quinoa is a magical and powerful little seed, providing 9 essential amino acids, making it a complete protein. Quinoa is gluten-free, cholesterol free, kosher for Passover, and almost always organic. It's similar to other whole grains such as rice, in that it is definitely very versatile. You can eat it plain with some olive oil, sea salt, and lemon juice, jazz it up with cheddar and broccoli, or add lots of colorful veggies like in this recipe! 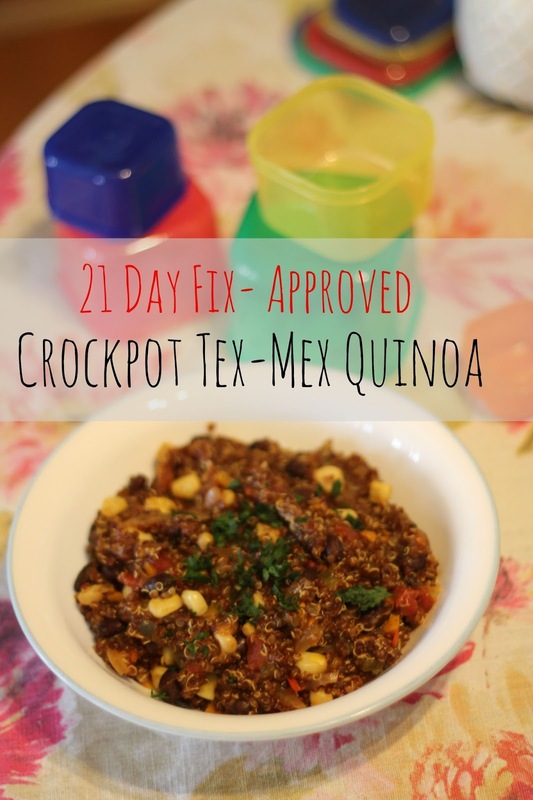 I found this recipe on Pinterest while looking for 21 Day Fix recipes, and could not wait to make it. I am nearing the end of the 21 Day Fix- CANNOT WAIT FOR IT TO BE OVER- but will continue to make this. It makes an excellent vegetarian main course, a tasty side dish, or the perfect filling for burritos! Optional Toppings: cilantro, cheddar cheese, sour cream (or 21 DF-friendly Greek yogurt,) parsley, hot sauce, etc. Rinse the quinoa well- this is VERY important! Chop the sweet peppers and the poblano pepper, removing the seeds if desired and add to the crockpot with the chopped onion and minced garlic. Add spices and chicken stock, stirring together. Cover and cook on high 3-4 hours. The liquid will begin evaporating. Is that not the most colorful food you've ever seen? And SO full of flavor from all those beautiful veggies! I did use chicken stock as I had it on hand and sitting unused in the fridge, but feel free to keep it vegetarian with vegetable stock or water. I grilled some chicken breast and made a bowl out of dinner, topping it with cheddar cheese, Greek yogurt, parsley, and sriracha- all 21 Day Fix Approved! I measured this out in the yellow container (1/2 cup) and counted it only as a yellow. This makes a MASSIVE amount. It's just my husband and I, and we've had this for 3 meals now plus lunches, and there's still two glass Pyrex containers left. Have any of you frozen quinoa before? I may need to try it, because as delicious as it is, I'm quinoa-ed out. What are some of your favorite quinoa recipes? This sound yummy. Also happy to see you posting. I have never tried this!! Awesome idea! !